On mobile devices people shop differently. They are often more relaxed and leisurely looking for things that inspire them. Therefore, a feature that any shopping app should have is a lookbook. It’s the part of your shopping app where consumers can view your products in a real life setting. Browsing products this way leads to higher revenue as we have found out by analyzing data from our customer PME Legend. What exactly is a lookbook? Just a little explanation before we dive further into the details. Lookbooks — also referred to as a Shop the Look section in your shopping app — give the visitor a view of your product as it would appear in real life. So instead of showing just the jeans or a leather jacket in a catalog view, you show your products in a real life situation. Next to a campfire, near an airplane or in a really cool urban setting as typical fashion shoots do. To show you an example we made a video of one of the cookbooks present in the 9 Straatjes Online shopping app. They are a fashion retailer. We believe lookbooks are indispensable for any shopping app. When using a shopping app customers are on the couch, in a comfy chair or even in a bed. They are using their smartphones or tablets and thus their fingers to navigate. This setting brings a totally different mindset to the consumer browsing your app. A mindset that allows you to inspire that very consumer. And inspiring is done with great content. We see a lot of great photos and even videos being used on e-commerce sites and in shopping apps. However, what we often find missing is a direct way to buy from this type of content. At best we see a product link presented along with the content. But that takes the consumer out of the inspiration mindset and into the cold hard catalog. We believe inspirational content must be connected to function. Thus, combining the content with the ability to buy. Exactly as you saw in the 9 Straatjes online lookbook video above. And that vision leads to higher revenue as you’ll see in the research below. 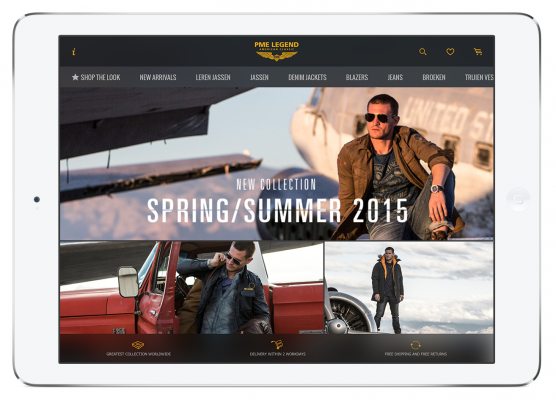 To show you the impact of using a lookbook, we looked at last months data of clothing company PME Legend. We compared the behavior of consumers that did or did not use the lookbook during their session. Consumers that used the lookbook during their session converted 52% more than those who did not. And if you look at the average order value of the consumer there is a difference as well. 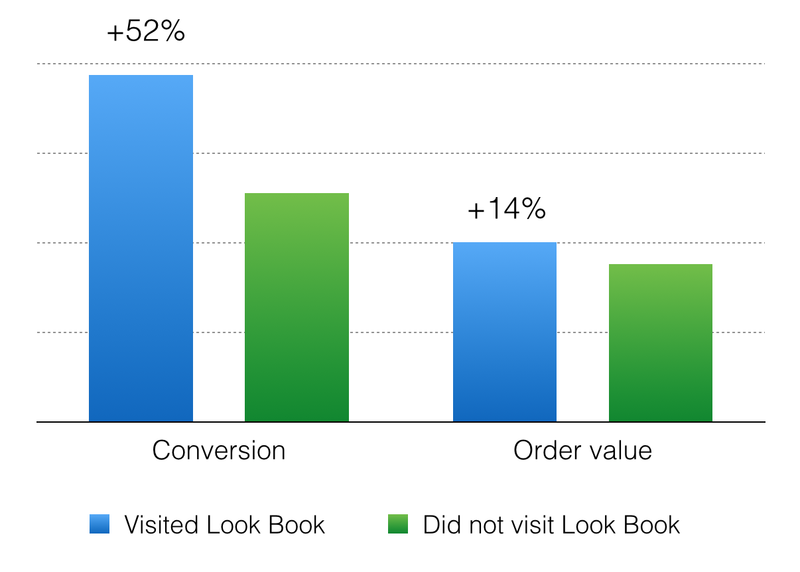 When consumers visited the lookbook, their order value was 14% higher those who did not. Another important fact to notice — not in the chart above — is that consumers that used the lookbook spend twice as much time in the app as those who did not. Twice as much time connected to your brand allowing you to inspire them is something any brand wishes for. Do you have the right content to create lookbooks? If so, how much effort does it take to create and maintain them? Just to give an impression of what it takes to create lookbooks let us show you the way it’s done in Highstreet. We realize that content creation for online shops needs to be simple because retailers have a lot of work on their hands. That’s why we designed a content management system that makes creating a lookbook a simple experience. 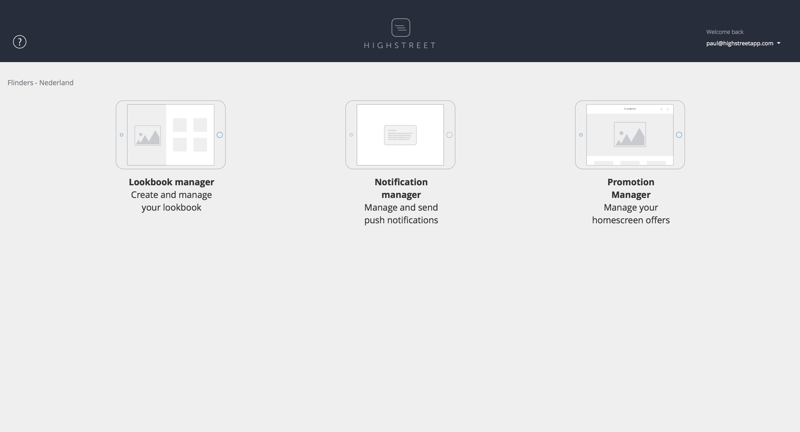 So after you launch the Content Management System you have three options: Lookbook manager, Notification manager and Promotion manager as you see below. 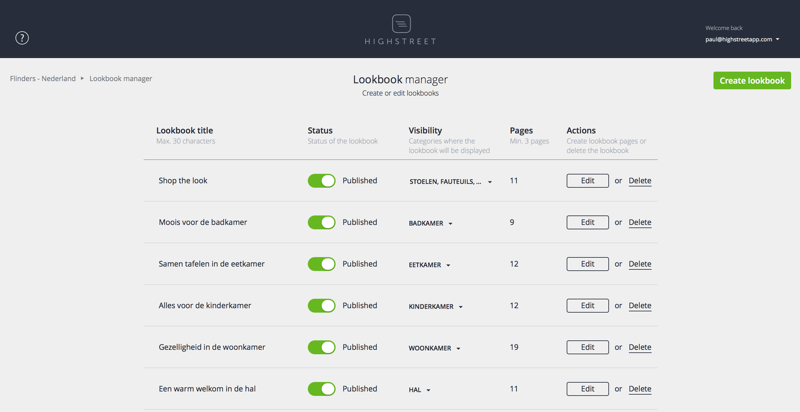 When you start the Lookbook manager you see an overview of all the lookbooks created, whether they are published or not, where they are visible and the number of pages they consist of. Diving a little deeper you can actually see the lookbook in action and scroll through the pages. When you need to edit a lookbook page, you open it and are presented with the image and the related “Hot Spots”. The hot spots are areas that attract the consumer’s attention and indicate that there is an action possible. In this view you can drag the hot spots around and connect them to the products in the shopping app. 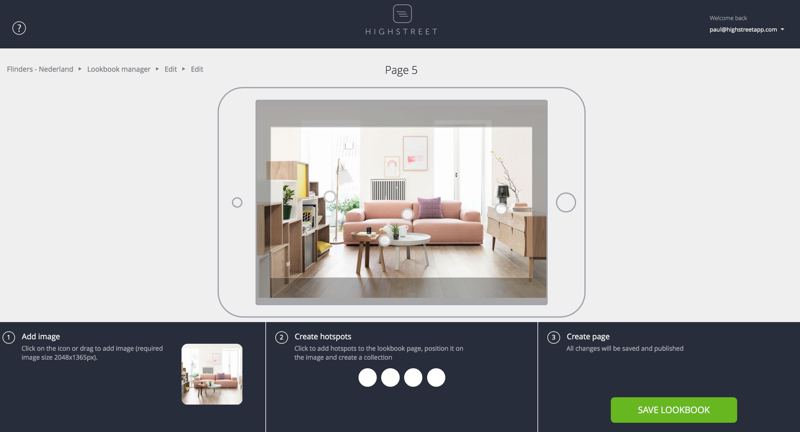 When consumers press the hot spot Highstreet shows your products so they can add them directly to their shopping cart. Without leaving the inspirational content for even a second. And that’s how we connect inspiration to the buying function in your shopping app. We love to tell you more if you are interested. 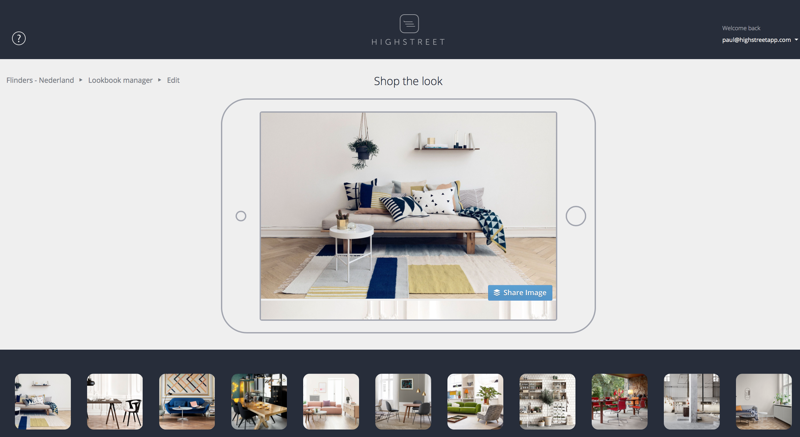 Happy app shopping from the Highstreet Team.